The manuscript consists of two originally independent parts as well as two fragments: Fascicle I (foll. 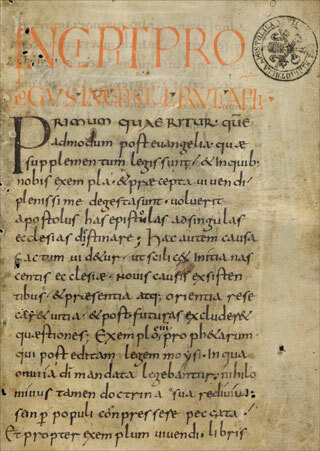 1-7) was compiled around 850 in Lorsch, fascicle II (foll. 9-172) was written in the 1st half of the 9th century in Lorsch. The fragments presumably served as front and rare guardleaves for the originally independent fascicle II: Fragment I (fol. 8) was possibly written in Lorsch in the 3rd third of the 10th century, fragment II (fol. 173) was compiled in the 11th century. Its place of origin is unknown.